What is the problem with ‘no excuses’ anyway? 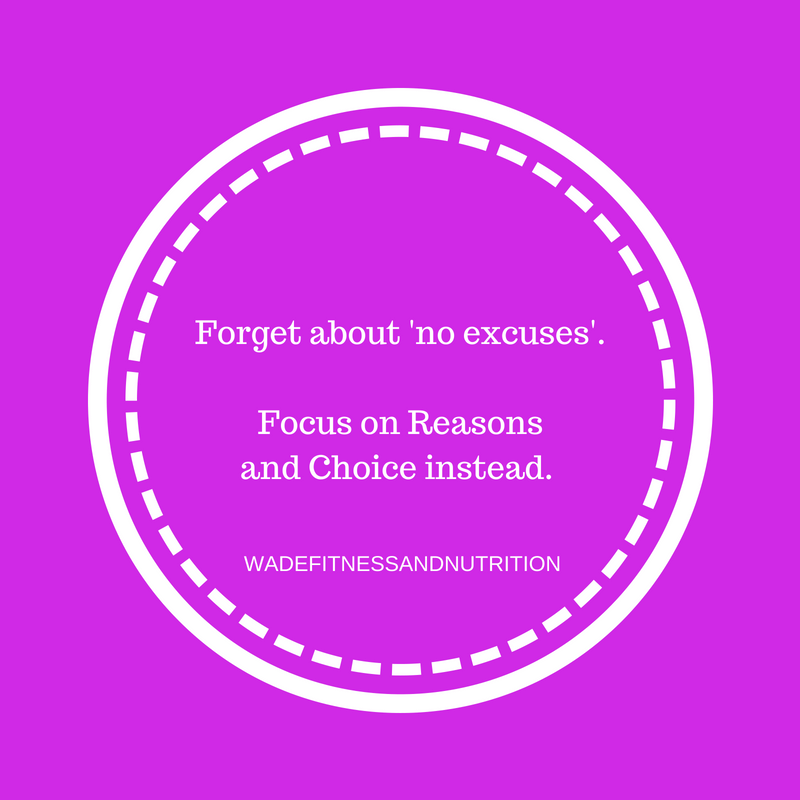 ‘No excuses’ is a very common saying in the fitness world. And at its root, what does it really mean? It means that you should make exercise and eating well the highest priority in your life. Get your workout done at all costs. Resist that cookie at all costs. Nothing is more important than ‘fitness’…right? If you know me, you know my answer to that is: WRONG. Why should fitness/dieting/losing weight/working out/etc. be the most important thing in your life? And to pursue it above all else? This idea is in and of itself privileged. There are a lot of things more important than getting a workout in for a hell of a lot of people. If you are poor and work more than one job just to make ends meet, a workout may not be a priority. If you struggle with a chronic illness (or more than one like me! ), some days are just a total loss and you know it when you wake up that morning. If you are a caretaker for someone who depends on you, there are days where you can barely even get the time to sit down to eat. And nutrition? It can be even more difficult. Food prep done in advance is a privilege that requires time and skill. And you know what? If you’re strapped for money, forget about “investing in your health” with organic meats, fruits, and veggies (I hate this whole idea and plan to write something else on it). No. That doesn’t happen in my home. At all. I rarely food prep, because I have a lot of things going on, and I can’t always devote the time to it. I’m usually doing school work or cleaning or several other things instead. Are these things excuses? I don’t think so. They’re REASONS. Hear me out, because I know it seems like a cop-out. It’s really not. The truth is that life is not conducive to a ‘no excuses’ attitude. Things happen. Balance is key to continuing any type of progress you are trying to achieve. And reasons are different than excuses. What I really want is for you to be honest and reasonable with yourself. Just this morning I woke up after a night of my shoulder bothering me, and my hips and lower back were bothering me. Did I go to the gym and push my body anyway? Hell no. I did my morning routine, then I went grocery shopping, and then I had a hot bath until I had to go pick up my son at school. And I do feel better now. If I had gone and done my planned workout, what might have happened? I would probably be fighting a muscle tension migraine right now, struggling to take care of my son on my own until my husband gets home at 6, 3 hours from now. But I’m writing this right now because I honoured my body and I had a decent reason. Now, don’t start thinking that reasons are a way to get out of ever taking care of yourself, however that looks for you. They aren’t. But since I listened to my body’s reasonable need today, I can still get everything done that I needed to today, and I can resume my regular schedule tomorrow morning with my usual yoga class. The purpose of reasoning instead of excusing is to stop, listen to yourself, and honour your true needs. For me, that means that not pushing my cranky body is a priority. It also means that mental health will always come first. It means going for a walk instead of doing a heavy lift session some days and vice versa. Listen to your body. Rely on reasons, and not ‘no excuses’. Sit down and intentionally think about the times when skipping exercise might actually be better for *you*. Maybe it’s when your kids slept poorly and you’d like to get more sleep instead. Maybe it’s on days that you know you struggle with for personal reasons. Maybe it’s the day after a long, labour intensive day and your body could use a lazy day. Don’t rely on the voices around you. You know your body and spirit better than anyone. Decide what makes a good reason for you, and find something else to fill that time. Think of all the other things you could accomplish or learn or experience. No, not ‘no excuses’. Let’s do reason and choices instead.